The HL single shaft shredder is unique in it´s capability of processing a wide range of materials: solid wood, particleboard, MDF, cardboard, paper and pallets. Rotor and shafts for the HL 2/5/5 and HL 2/7/10 are turned from one piece of steel grade ST.60. All other rotors used for the HL-series are a 2 piece construction using a high grade chrome-nickle steel for the shaft .The rotor body is turned from a steel tube ST.52. The rotor body and shaft are connected using high torque, conical power locks. 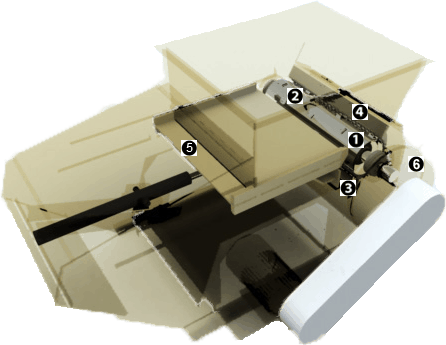 The knife geometry is unique for Scanhugger and was invented in 1987 to eliminate the severe damage on knife seating and rotor body, that is common on shredders with diamond shaped knives. The knife has a positive cutting angle and a close tolerance to the counterknife. Rotors for HL 3/12 , HL 4/14, HL 4/18 and HL 5/22 have a machined chip pocket in front of each knife position, that allows the chips to clear out of the cut. The counterknife is divided in 2 or more sections depending on machine model. The counterknife has a fixed position on the counterknife support. The counterknife support is a precision machined solid steel bar grade ST.52 and is locked into the machine frame and supported by a steel plate. The counterknife has 2 usable edges. The chip size is determined using a heavy duty chip screen with square holes. Hole sizes range from 15x15 mm to 70x70 mm in perforated steel plate. Hole sizes from 80x80 mm are a welded construction. There is access to the screen through the hinged cover on the machine front. The ram is mounted with 4 guides to steer the ram vertically and horisontally. The guide material is compressed cotton fibres with an extreme high density. The material is able to absorbe grease and if greased at regular intervals they become self lubricating. The HL 4/18/20 and HL 5/22/25 has cam follower bearings mounted in addition to the phenolic guides. The transmission features main drive motor, v-belt drive with 1,6 servicefactor and a helical gearbox which is rated for 2 times the main drive motor.